That's why you do NOT remove it. I always /)_- when my opponent does that. Am I the only one who was super disappointed in this card? Does this make demon based decks good? I've played against it a few times in ranked decks but those games are usually blow outs (Hunter/Zoo player here). Playing a deck with 1 of these and 1 illidan, killing it off on turn 4/5 and getting a free illidan in play. Yeah, I can see this being a fun card. I think it would be pretty good in decks that run shadowflame. He is a demon himself, so you could even use the demon buff cards on him first if you had too. 4 for 3/4 is not terrible as a bland minion. I guess it would depend a lot on his summons triggers the battlecries as Pewpewblast mentioned. Edit: I could have sworn that this said "a random minion" in the original iteration and not "a random demon", but thank you for the flood of downvotes for an out-of-date comment. It's all about the wording in the text of the card. Putting the card is far different from playing the card. 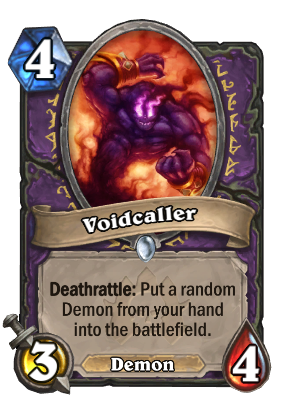 The card says to "PUT" a random demon from the hand into the battlefield. Battlecry effects will only trigger when the card is "PLAYED" from the hand. To be fair, Bridius, some cards outright lie. Knife Juggler for instance says "When YOU summon a minion", and yet minions summoned for you by your opponent (e.g., Leeroy, Deathlord, etc) which explicitly say that YOU summon a minion FOR your opponent, but the knives still trigger. I swear to hell I could have sworn it originally was "summon a minion from your hand", e.g., Alarm-o-bot style. :( At least I scratched it out so HOPEFULLY people won't be mean.